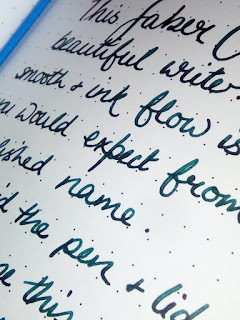 There's been quite a lot of writing getting done here at Her Nibs Towers this week so it was a perfect opportunity to unfurl the Faber Castell and put her through her paces. First of all, there's an outer cardboard slip and then the presentation box, which is very smart. A little pull ribbon loop helps the pen tray slide out - very civilised. I hate trying to prise my way into boxes that results in a shredded box and a worse shredded temper. The pen is substantial, weighing in at 50g (with a little ink in it at this point). 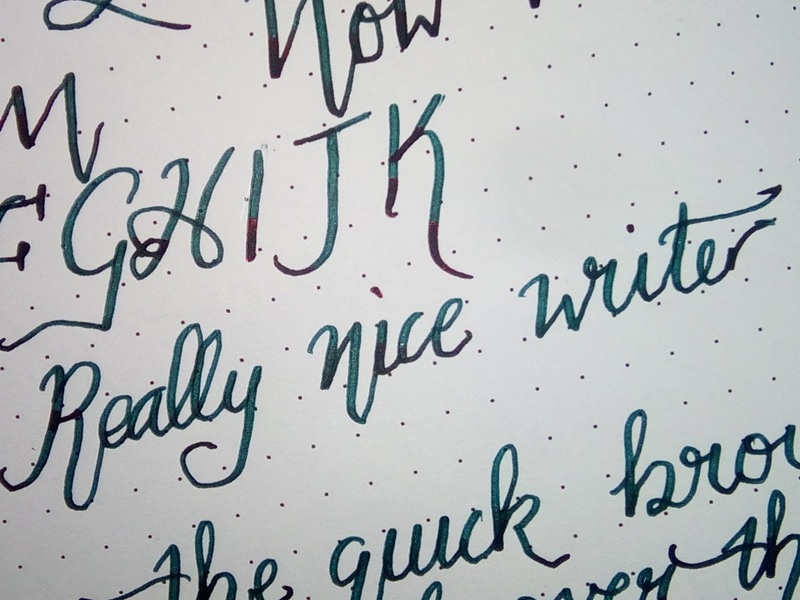 The split between pen and cap surprised me - the pen is 28g and the cap is 22g. The cap feels heavier to me! The cap is chrome with a pleasant sprung clip that helps keep it snug and secure in your pocket - you don't want your £100 pen dropping into your coffee ... or worse! the words 'Faber Castell since 1761' and their two tiny jousting knights logo are engraved on the cap. It's a screw cap - nice smooth motion. However, when you post the cap, it doesn't pop into place. I confess to preferring pens whose lids post securely - I'm the sort of person who can lose a pen cap in 20 seconds from uncapping. If you persevere and post the cap, it does make the pen feel top-heavy. So, I am assuming that the cap is not really designed to be posted to the pen. The pen itself is a smart blend of polished chrome and a black resin barrel in a sophisticated herringbone pattern. I have noticed that the chrome cap does cause slight scoring on the resin. But I use a jeweller's loupe to examine pens very closely and you can barely discern the scoring without one. So not too much to worry about. Unscrewing the section from the barrel is as smooth as silk - the resin barrel has a chrome threaded insert. Inside you can use cartridges or a convertor (the pen comes with a branded Faber Castell convertor if you like your ink to be wild!) Note: Standard sized and giant cartridges are available. 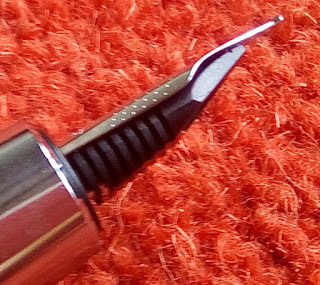 The nib is medium, stainless steel - again with the two little jousting knights and an M clearly etched. But there are other options available when buying - Extra Fine through to Broad. The crucial question - how does it write? I found the nib smooth and the flow to be good and a little wet. It has been very hot in Scotland this week and there were, if I'm honest, a couple of times when the ink sputtered to a standstill, but started back up within a few seconds. I'm attributing that to the heat and the speed with which I was having to record quite a lot of information. Nib - still cannot master close up pix! 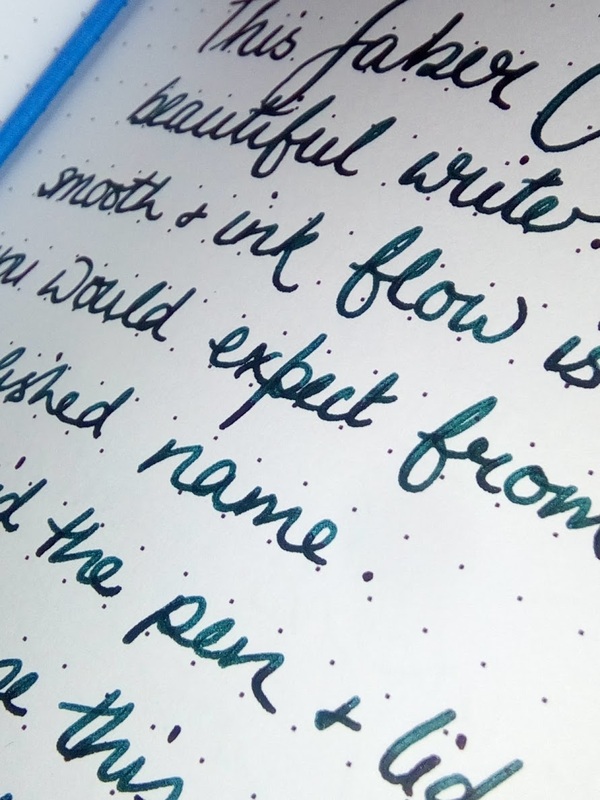 This is a quality pen that is lovely to write with, but for me the lid not posting securely is an issue and the scratching of the barrel might become more noticeable over time.